When the sun shines through beads of water, they can act like a lens and leave permanent spots on the finish of your car! 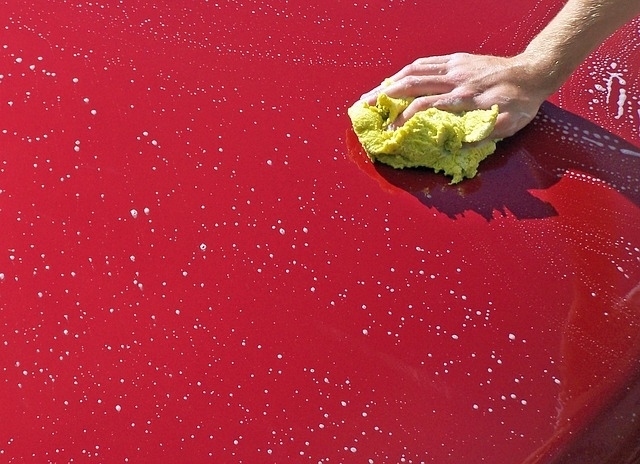 The more dirt you can remove with your hose, the less likely you are to scratch your paint by rubbing dirt into it! Don't skimp on the soap! The suds are what lift and carry the dirt away. Using a nice, soft wash mitt or cloth, clean your car from the highest point to the lowest. Start on the roof, the hood and trunk lid, then down the sides. Working in this direction will ensure you're not moving dirt to parts of the car you've already washed. There's probably much more dirt down here, and you don't want to be dragging that from below the moldings to above the moldings, where it will be more noticeable and more likely to scratch the car! Now that you've finished washing the rest of your vehicle, you can tackle the really grimy areas like the tires and the wheel wells. Now that your car is squeaky clean, you can practise your careful driving and try to avoid every puddle in your path!